(1) Make the report! - It would be very helpful for you to have a quick read through this guide before making a report. But if the information is too much to take in, please don't be put off. We will still be happy to see what issue you are having, even if it's a duplicate. Devs or other active forum members (like me) will try to help you with getting the right information in the right place. (2) Not sure if it's a bug? - then post a new thread in the "Community Help, Questions and Guides" section. 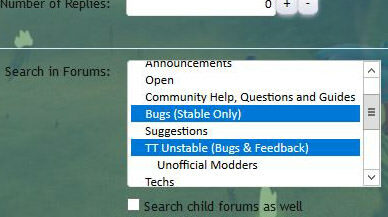 If it is, then a moderator may move the thread over to the correct bugs forum, for you. Also, post there if you maybe want some help figuring out an aspect of the game. "Bugs (Stable Only)" - if you are running the default version of the game (e.g. 0.7.8) on PC. All console reports in this section too, please, marked with "[Xbox]" or "[PS4]". "TT Unstable (Bugs & Feedback)" - if you have switched to the unstable branch, in the game's Steam library -> "Properties" -> "Betas" tab (e.g. 0.7.8.1). See this video for how to switch (and back up your save files and snapshots first). "Multiplayer" - for any problems encountered specifically in this mode. (4) Search for existing threads - It's certainly worth taking a quick glance down the first page of the relevant forum section, to check no one has just posted a thread on the same issue you have found in a new patch. But there are a lot of minor and non-critical bugs that have been around in TerraTech for many months, so it's fairly likely that the problem you are seeing has been reported previously. So, please check the "Commonly Reported Bugs" section, below. The forum's built in search if pretty good, but you could also try starting from this advanced Google search. (6) Create a new thread - briefly describe the steps needed to repeat the bug, if possible, as per this example report by lead QA (Quality Assurance) dev, @Adriano. “The anchor on the SCU was placed incorrectly, sticking out of the side of the SCU. Then add a concise description of what the bug relates to, including key words. e.g. : "Inventory block duplication when controlling very large tech". (8) Context - State which game mode you were in: Campaign, Creative, R&D, Gauntlet, Sumo. What you were doing just before (if relevant). What tech the problem occurred with, etc. Uploading some of these can be extremely helpful for the devs to see and reproduce bugs. Please Zip the appropriate crash folder and drag-drop it onto the post you are writing, to attach it. Even if the game doesn't crash or make a crash folder, the "output_log.txt" contains helpful telemetry data for the devs. It is wiped and overwritten each time you re-start the game. See this post for old/alternative Mac and Linux locations too. (10) Compress large file attachments - the forum has a 3 file attachments and 1MB upload limit (see here). So log files that are spammed full of repeated error lines may be too big and need to be Zipped. I recommend using 7-Zip (download), if you don't have anything already. (11) Screenshots - being able to see what's going on is often essential, so please provide a screen capture, if you can. To fit within the 1MB limit this should be a ".jpg" file, not a ".png". Ideally, you should host the image externally (e.g. somewhere like Imgur, or shared though Steam, if you like). This will ease the bandwidth use for the over-burden forum. (12) Tech Snapshot - if the problem seems specific to a particular tech design, then please attach it's ".png" file to your post. They are found in the "Snapshots" folder (in game the directory shown above). The model data is cleverly encoded and hidden in the image file, so do not edit the image first, or upload it to a site that will compress the file in any way. Attach it directly, they're fairly small. (13) System specs - particularly for performance issues, weird graphical glitches or failure to launch the game, it can be very helpful to post up exact PC hardware and software specs. For Windows users this is most easily done using DxDiag.exe (short instructions from Microsoft). This can be saved as a ".txt" file and drag-dropped to a forum post. Please bear in mind that we’re looking for people who have a high standard in their bug reporting. We need people who can report a bug clearly and concisely, know the right kind of information they need to include in a report, and can work with others to help track down ways to reproduce some of the more troublesome bugs. You may also want to give some carefully thought out feedback on recent changes and additions to the game in Unstable patches, using the "TT Unstable" section (i.e. not "Suggestions" for totally new content). Enormous piles of auto-mined resources [report], that have sprung up just out of sight (at forgotten mining sites, within 600m of players current location). Each underground resource seam contains 1000 chunks (taking about 10 hours to extract with one miner). The physics burden of all these little objects colliding is enough to give any machine a lot to think about. And auto-miners play catchup when you return, after an absence, suddenly spurting out all the chunks that they should have popped in the time you were away. Duplicated techs can cause horrible FPS drops (and crashes) when they intersect, see point "(f)", below. (b) Friendly AI is dumb - yes, most tech designs will struggle to "Follow" the player, often not moving at all on certain wheels (e.g. tracks). Techs also jitter, turning back and forth, even while in "Idle" mode. Sumo, Gauntlet and R&D Test Chamber may start with an initial noticeable stutter depending on how many Tech snapshots are present in the TerraTech folder. (a) Why do my posts need to be approved? 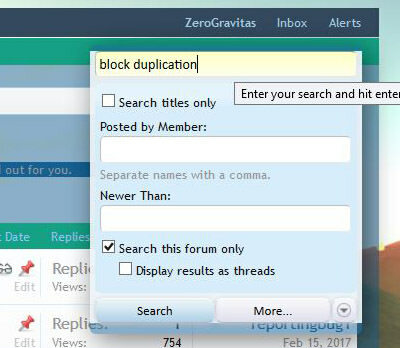 - all new users must make 3 posts that are approved before the forum should then automatically authorise them for all future posts. If your 4th or 5th post still needed authorisation, then please make a post on this thread, saying so. @Suiwun will then authorise you manually, when he's next in the office and able to (usually very quickly). (b) Why do I keep getting errors? 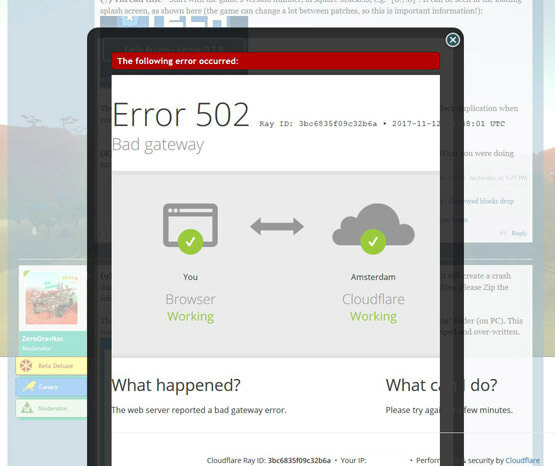 - this is an issue with the site hosting that the devs have been unable to get fixed. Often they can just be ignored. But they are fairly likely to cause you loss of input information at some point, particularly when editing an existing post, when there's no draft saving functionality (as just happened to me while writing this). It's probably better to click the "More Options..." button, at bottom of the pop-up post editing box. This gives a full page editor. Personally, I copy the body of the message I'm writing repeatedly, with Ctrl+[A], Ctrl+[C], so I can paste it back in when an error vanishes the editor window. Also before clicking "Save Changes"/"Post Reply". Please post any questions about bug reporting below (not questions about specific bugs). Should 'dead' blocks that don't respond to magnets/SCUs be in this list? I don't know of any reports but figured it might be common since I see it regularly. It's another one that's tough to reproduce in part because it depends on dropped blocks. Maybe I should try and get good data and submit a report...? One thing I noticed is that if I forced the block into inventory, the next dead block would be the same. If I left it alone I'd get a different dead block the next time (usually). I showed a way to reproduce it here in this thread about making Cabless (unanchored) techs. I don't appear to have made a separate thread for it though. So if you find one, or make with new insights, then please tag me and/or link/quote my existing information. Interesting. So maybe on enemy techs if I can pop a block off while the last cab is dying it will reproduce it. Something to try anyways, and I'll try to further our information in any case. edit: It's always just one block. Edited patch number out. If that's the most outdated info, I'm happy. I just editing in a link to the new Multi-player forum section, earlier today. I'm on 0.8.1 (gog) on Mac, i couldn't find the output log under ~/Library/Application Support/TerraTech/ as mentioned above (the patchnote for 0.8.1 mentions only saves and snapshots), but i found them under the location mentioned in this thread. Hmm, I'm not 100% that this is not because you are using the GoG version, which I know sometimes lags a little behind Steam and might even use different directories going forwards. It would be helpful if a dev could give some guidance here: @kae, @Sdarks, etc, as I tried @Adriano on that other thread already (which I've now linked in the "different directories" Spoiler, above). It would be helpful if a dev could give some guidance here: @kae, @Sdarks, etc, as I tried @Adriano on that other thread already (which I've not linked in the "different directories" Spoiler, above). Me neither, it could just be the GoG version, that's why i mentioned it. But the 0.8.1 patchnote on Steam you have linked above doesn't mention the output logs or crash files either, so it might have just been a misunderstanding.